Three Main Types Plus Six More - Which Is the Worst? 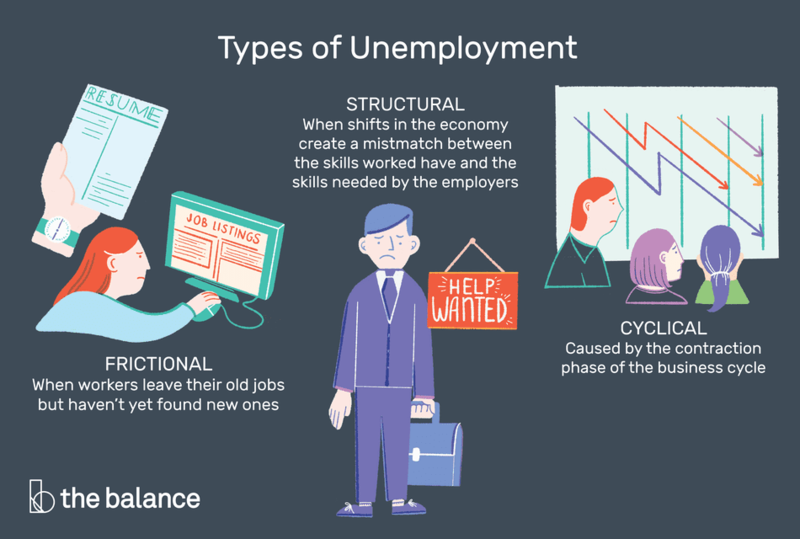 There are three main types of unemployment: structural, frictional, and cyclical. The first two make up the natural unemployment rate. The third rises when demand falls, usually during a recession. Some economists define as many as six additional types of unemployment, such as seasonal and classical. This article summarizes the nine types of unemployment, including explanations of the terms 'real unemployment' and 'underemployment.' Links to more detailed articles are included in case you would like to know more. In addition, find out how unemployment is measured and why some experts say it doesn't capture the real unemployment rate, and learn how U.S. unemployment has ​fluctuated over time. There will always be some level of unemployment, even in a healthy economy. The lowest level of unemployment was 2.5 percent, right after the Korean War. This was an economic bubble that soon led to a recession. The natural unemployment rate of 4.5 to 5 percent is a healthier indicator. Natural unemployment consists of two of the three main types of unemployment: frictional and structural. Frictional unemployment occurs when workers leave their old jobs but haven't yet found new ones. Most of the time workers leave voluntarily, either because they need to move, or they've saved up enough money to allow them to look for a better job. Frictional unemployment also occurs when students are looking for that first job or when mothers are returning to the workforce. It also happens when workers are fired or, in some cases, laid off due to business-specific reasons, such as a plant closure. Frictional unemployment is short-term and a natural part of the job search process. In fact, frictional unemployment is good for the economy, as it allows workers to move to jobs where they can be more productive. Structural unemployment exists when shifts occur in the economy that creates a mismatch between the skills workers have and the skills needed by employers. An example of this is an industry’s replacement of machinery workers with robots. Workers now need to learn how to manage the robots that replaced them. Those that don't learn need retraining for other jobs or face long-term structural unemployment. A long recession often creates structural unemployment. If workers stay unemployed for too long, their skills have likely become outdated. Unless they are willing and able to take a lower-level, unskilled job, they may stay unemployed even when the economy recovers. If this happens, structural unemployment leads to a higher rate of natural unemployment. Cyclical unemployment is not part of the natural unemployment rate. It's caused by the contraction phase of the business cycle. That's when demand for goods and services fall dramatically, forcing businesses to lay off large numbers of workers to cut costs. Cyclical unemployment tends to create more unemployment. This is because the laid-off workers have less money to buy the goods and services they need, further lowering demand. Government intervention, in the form of expansive monetary policy and even fiscal policy, is required to stop the downward spiral. After the stock market crash of 1929, the government did not step in right away. This led to the Great Depression, which lasted 10 years and led to a 25 percent unemployment rate. Long-term unemployment occurs for those actively looking for a job for over 27 weeks. The effects are devastating. Many employers overlook someone who's been looking for that long. The emotional and financial costs can be very damaging. Sadly, a higher percentage of the unemployed fall into this category than before the financial crisis or in prior recessions. Discouraged workers are those who have given up looking for work. Part-time workers who would like a full-time job. Some people argue that the real unemployment rate during the 2008 recession was as high as the 25 percent rate during the Great Depression, but this is not true. The "real" U-6 rate reached 17.5 percent on October 2009, the height of unemployment in the Great ​Recession. Some sources include seasonal unemployment as another type of unemployment. It is part of natural unemployment. Like its name suggests, seasonal unemployment results from regular changes in the season. Workers affected by seasonal unemployment include resort workers, ski instructors, and ice cream vendors. It could also include people who harvest crops. Construction workers are laid off in the winter, in most parts of the country. School employees can also be considered seasonal workers. The BLS does not measure seasonal unemployment. Instead, it adjusts its unemployment estimates to rule out seasonal factors. This gives a more accurate estimate of the unemployment rate. Unions negotiate higher salaries and benefits. Long-term contracts set a wage that has become too high due to a recession. The government sets a minimum wage that's too high. The result is that companies must pay more per employee, so they can afford fewer employees. Those that are laid off are victims of classical unemployment. Underemployed workers have jobs, but they aren't working to their full capacity or skill level. This includes those who are working part-time but would prefer full-time jobs and those who are working in jobs where they aren't being utilized. Underemployment is often caused by cyclical unemployment. During a recession, underemployed workers will take what they can to make ends meet. Some definitions of underemployment include unemployment. Others include segments of society that are not included in the standard definition of unemployment but are counted in the real unemployment rate. Awareness of underemployment helps you understand the big picture of unemployment. They aren't working, even part-time or temporary. They are available to work. They actively looked for work in the past four weeks. This last point is important and often controversial. If someone has stopped looking for work, the BLS no longer counts them as being part of the labor force or as unemployed. However, it does report them separately under the category of "marginally attached to the labor force," so a sense of what unemployment would be if they were counted can be determined. The labor force participation rate follows the BLS’ definitions of the employed, unemployed, and the civilian population it is being measured against. To calculate the unemployment rate, divide the number of unemployed by the number in the labor force.